Water Tanks For Sale at Factory Wholesale Pricing! 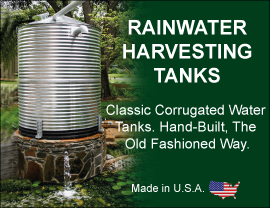 WaterTanks.com has been serving the residential water storage market for over 30 years across the United States. With our many years of experience and the most dependable water tanks for sale made by Norwesco, our friendly and knowledgeable staff will make your water storage project as easy as 1-2-3! Our extensive line of tank accessories makes installing any of our tanks a breeze. From rainwater to fire suppression or ozone water treatment, we can help take your next project from concept to reality without the headaches. For a better look at our extensive line of accessories, click here! From full house pressure systems to well pumps and pressure tanks, nothing performs better than a Gould’s Pump. As a certified Gould’s Professional Dealer, WaterTanks.com has the knowledge and years of expertise to help you find the right pump and pressure system for your project. For a better look at why the Goulds Full House Aquaboost II system will work for you, click here! Let our friendly and knowledgeable staff walk you through the vast selection of water tanks for sale at great factory direct prices. Contact us today to learn more.